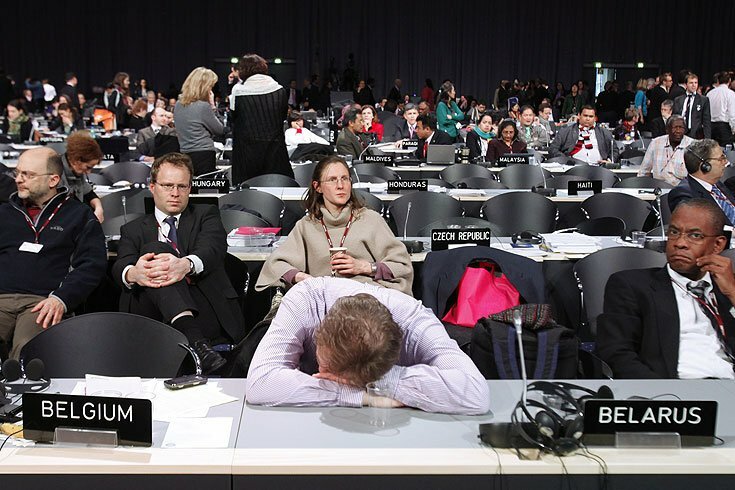 “The procedural issue which had undermined last June efforts of one of the working groups at the climate negotiations in Bonn, has been once again included in the agenda of a higher level negotiations: the UN Conference in Warsaw. Observers of the climate negotiations hope that Russia and Belarus’s proposal will not create obstacles for the negotiations as was the case in the previous session. Russia and Belarus brought up their proposal regarding the mechanism of adopting resolutions to the preliminary agenda of the Climate Change Conference in Warsaw. Let us remind that the events which had taken place at the UN Conference in Doha (Qatar) nearly a year ago gave the reason for countries’ “procedural” discontent: a non-consensus version of the document had been adopted despite Russia, Ukraine, Kazakhstan, and Belarus’s objections. Remembering this fact, half a year later, three countries (Russia, Ukraine, and Belarus) came up with a proposal to discuss the resolution-adopting mechanism. In the opinion of these countries’ delegations’ official representatives, there is no way to speak about a constructive and legitimate process without clear definition of the procedure which would satisfy all parties in the process. “We have serious concerns that if we do not hold now such discussion on the procedural aspects of resolution elaboration and adoption, we might find ourselves in 2015 again in the situation when all efforts undertaken will go down to the drain,” Oleg Shamanov, representative of the RF official delegation, commented. This proposal which had then got an informal name of the “Russian amendment” caused an adversarial position of a huge number of countries, especially of the Group of 77 and China. Acknowledging the importance of procedural proposals, opponents of the “Russian amendment” did not agree to include it as a separate point of the agenda justifying this with that only an “assembly of higher level” was authorized to discuss it, i.e., a Conference of the Parties. Besides this, as it follows from the preliminary documents, Kazakhstan came out with a proposal to additionally clarify conditions of one of the controversial points of the amendment to the Kyoto Protocol adopted in Doha. It speaks about a condition which de-facto leads to an “automatic” strengthening of transitional economy countries’ obligations; Kazakhstan proposed to specify which exactly data will be used for calculations under this point. Previously, EU representatives had stated that the issue raised by the countries will be also discussed in the course of preliminary consultations prior to the Conference in Warsaw in order to avoid possible frustration of the major negotiating session of the year by procedural disputes. Observers have no unified opinion regarding the possible scenario of the events related to the “procedural” issue: many had hoped that the issue will be resolved through preliminary consultations and negotiations prior to the Warsaw Conference. However, most of the observers see nothing catastrophic in the actions of Russia and Belarus and hope that there will be no repetition of Bonn in the sense of a long-term blocking of the agenda.